With a whole host of new festivals cropping up at an almost unstoppable pace to meet the nation’s ever-growing demand for live music, it can be hard to stand out. Although, Community Festival manages to do just that. Last year renowned bands such as Catfish and the Bottle, The Wombats and Slaves captivated tens of thousands in London’s Finsbury Park. 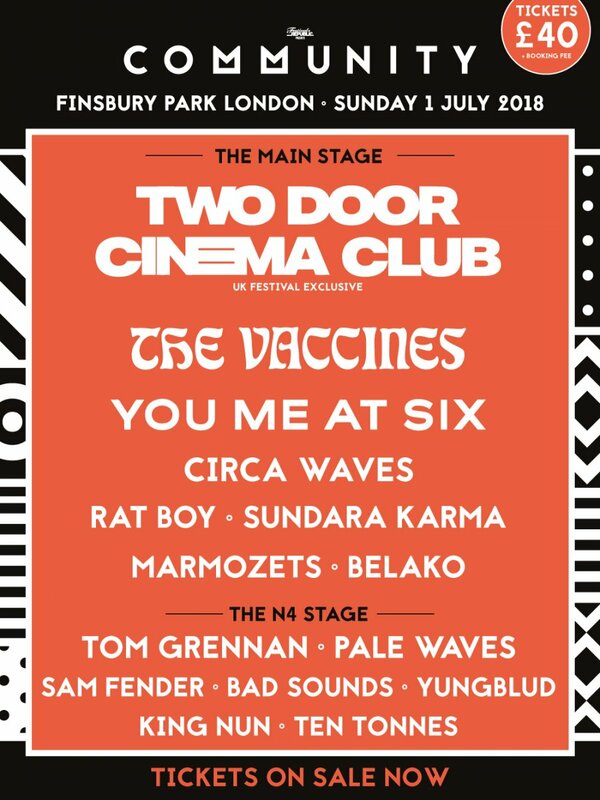 This year Community brings the phenomenal Two Door Cinema Club, a UK festival exclusive, alongside bands such as The Vaccines and Circa Waves. Some of the most exciting rising artists in the world such as Pale Waves and Tom Grennan also join this unmissable line-up. Building on the success of their iconic debut album ‘Tourist History’, Two Door Cinema Club have since released two more chart-topping albums and only last year played two sold-out dates at London’s cavernous Alexandra Palace. Expect to hear iconic indie anthems such as ‘What You Know’ and ‘Some Good Can Work’ expertly intertwined with newer tracks such as the effortlessly energic ‘Bad Decisions’ and perhaps even a taste of what’s to come from the band’s highly-anticipated 4th album. Tickets for Community Festival in Finsbury Park, along with further information, can be found here.